Create a seamless transition into your study with an Original Sliding Barn Door handcrafted from Solid Wormy Maple by our talented Amish Craftsman in North America. The Z track style is known as the original barn door adding a country chic feel to any room. Save space with an interior sliding barn door in your home. Available in a variety of sizes and finishes, you'll be sure to find the perfect fit for your space. Our sliding barn doors ship fully assembled and ready for installation. We recommend adding a mounting board to secure to the studs in the wall, then simply attach the track and hang the door. Check out How to Install Sliding Barn Doors Video located in the pictures of the product to watch us demonstrate the easy process. 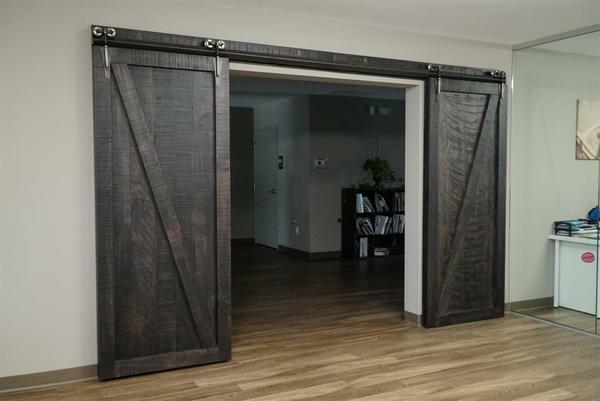 If you need a different barn door size for your home, please call one of our Amish Furniture Specialist to get a custom quote at 866-272-6773.